Narendra Modi speaking at the Maynaguri rally on Friday. 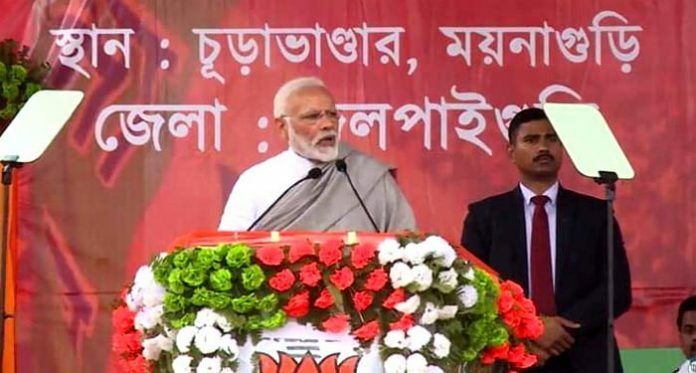 Siliguri: Prime Minister Narendra Modi has said that Chief Minister Mamata Banerjee is enmeshed in the dreams of being in power in Delhi and has left Bengal administration at the disposal of syndicates. Speaking at a rally at Maynaguri in north Bengal this afternoon, the PM also accused Banerjee of trying to save those who had looted lakhs of people in chit-fund scams. He vowed to drag both the looters and their protectors to the court of law. “Bengal’s CM is Didi but dadagiri is someone else is on. The state is now being run by Jogai-Madhai. 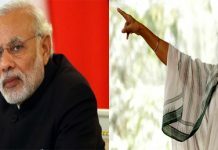 Didi wants to go to Delhi and hence, she has left Bengal to the syndicates to loot,” Modi said. Alleging that under Trinamool government, Bengal has become ill famous worldwide for violence and undemocratic actions, the PM said that it is the first time in India a Chief Minister sat on dharna to cover those who plundered people. “But let me assure the people of Bengal, this Chowkidar will not let off them at any cost: be it the looters or those who nurtured the looters. Let them give dharna, let them assemble all the leaders: I will still seek accountability for every single penny. We will bring the looters to the course of law,” the PM thundered. Without naming the Kolkata Police commissioner Rajeev Kumar, whose questioning by CBI was thwarted by the police last week, he said that those accused of being slack in probing the chit-fund scams must be probed thoroughly. 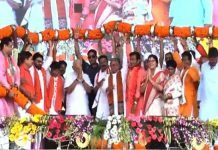 Modi maintained that people of Bengal want answers from the CM as to why she is so scared by the progress of the chit-fund scam probe. The way people in Tripura has buried the Left parties, the same is about to happen to the Mamata government in Bengal, he said. 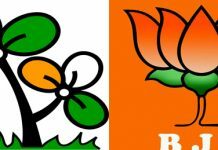 “In Didi’s Bengal, infiltrators are welcome but not the leaders of BJP which draws inspiration from Swami Vivekananda and whose architect was the great son of Bengal Shyamaprasad Mukherjee. This is a sign of Trinamool losing grounds,” Modi maintained. Before the start of the rally, the PM today inaugurated the Jalpaiguri Circuit Bench of Calcutta High Court and, laid the foundation stone of a 41.7 km four-lane highway between Falakata and Salsalabari at an estimated cost of Rs 1,938-crore. Referring to the Circuit Bench in his speech, he said that the High Court had decided to set up this some 20 years ago and the Union Cabinet had given its nod 13-14 years ago. “The HC kept on writing to the state government but the latter went on delaying this. But you have now finally got the Circuit Bench today which will not only save time but will also save money,” the PM said.